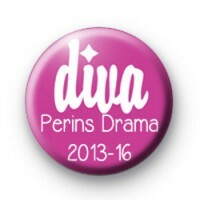 Custom pink diva badge for heather with the text Diva Perins Drama 2013-2016 in white. Standard 25mm button badges for her year 11 class. Hand made in our UK workshop.